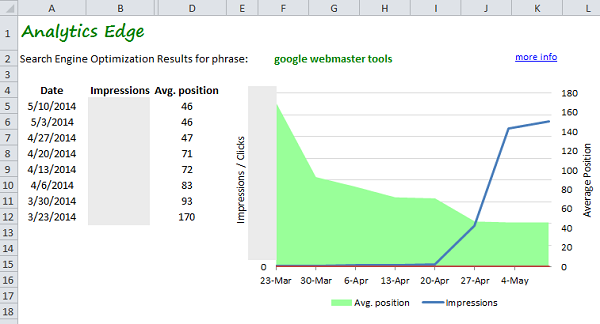 When I was working on a new Excel report for my Google Webmaster Tools connector, I started seeing traffic from a specific query phrase that didn’t make sense, so I dug a little deeper, and what I found made me question the very foundation of conventional SEO wisdom and the meaning behind Google Webmaster Tools data. Webmaster Tools says that it shows “queries that have returned URLs from your site” and the “average top position of your site” in the search results. I think maybe it did a long time ago and some of the algorithm changes they have made have slipped into the numbers. 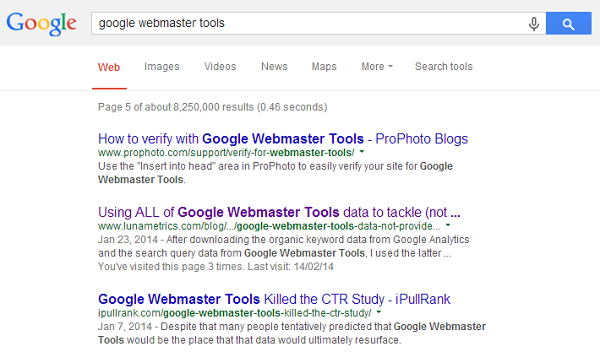 Oddly enough, the search query term I questioned was “google webmaster tools”, and I had just released the Webmaster Tools connector and thought I should start tracking to see how effective my various awareness-raising initiatives were. I was very surprised: of the 8.2 million results and thousands of excellent, well-established articles, my little site was already showing on page 4. What? How could THAT happen? I was doubly surprised because I had done almost nothing to promote it. How the heck did I get page 4? It turns out…I didn’t… but a LunaMetrics blog post did. The LunaMetrics article had a lot of social media coverage and quickly rose above the 8.2 million other pages of less-interesting material to garner a nice ranking. At the bottom of that excellent article is an innocuous comment I posted, with my name linked to my home page. It was nice that it got me a bit of traffic but the GWT clicks metrics seem to line up with what I saw on my web site, and the “impressions” and “avg. position” I am seeing in GWT must be for the LunaMetrics page. My site did not rank for that term – and I got traffic through a nofollow link! I understand that Google algorithms are quite complex, and they will drop your ranking if people don’t engage with your page, so they must be tracking what people do after they come to your site. They would know that people clicked through to my site after reading the article, but what is surprising is that they attributed some of the LunaMetrics impressions and position to my site as a search result. Yes, people found me through search, but it wasn’t direct. I am not complaining! This is absolutely wonderful! It means that GWT will provide me with search terms people have used to find me, whether it was direct, or indirectly through another website. #KeywordHeaven!